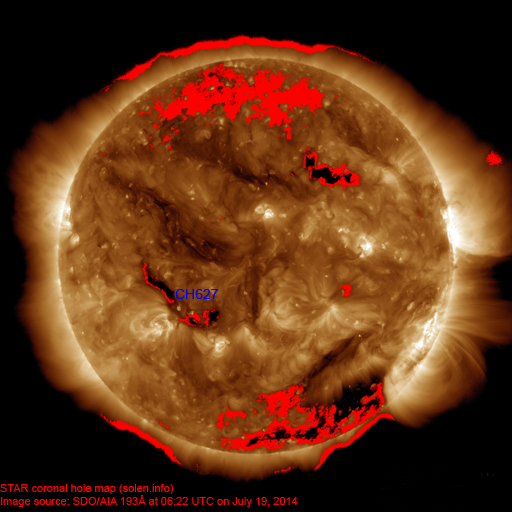 Last major update issued on August 1, 2014 at 05:05 UTC. 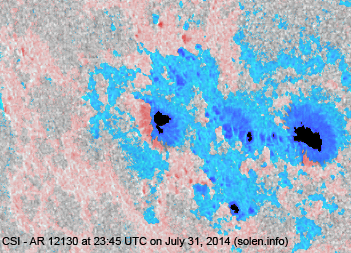 The geomagnetic field was quiet on July 31. 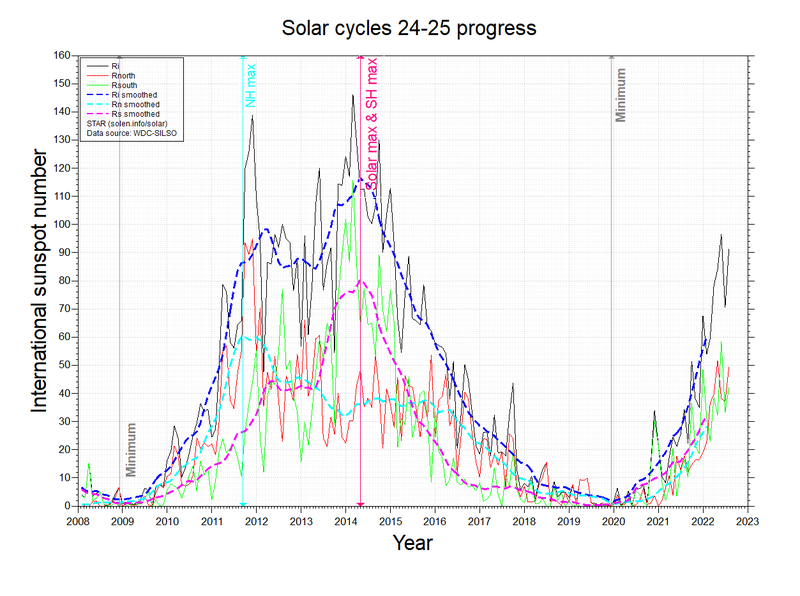 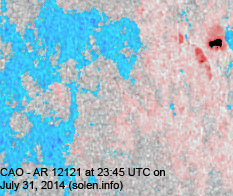 Solar wind speed at SOHO ranged between 275 and 302 km/s. 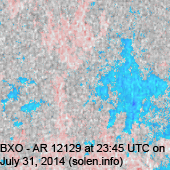 Solar flux at 20h UTC on 2.8 GHz was 156 (decreasing 31.6 over the last solar rotation). 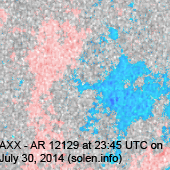 The 90 day 10.7 flux at 1 AU was 133.6. 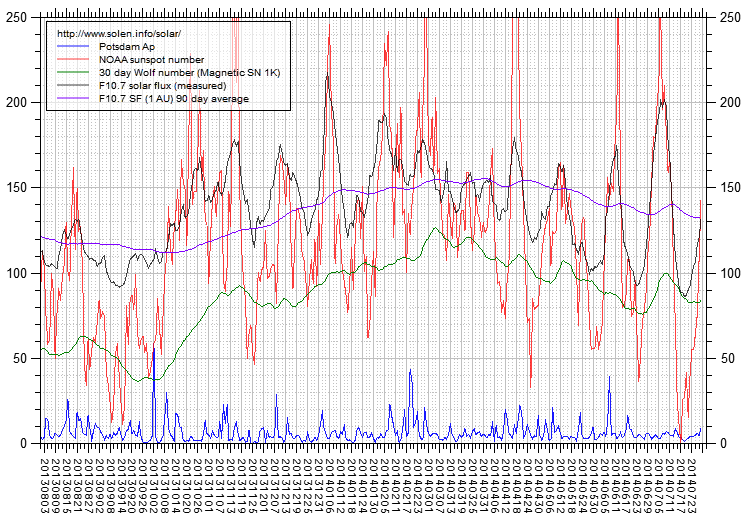 The Potsdam WDC planetary A index was 4 (STAR Ap - based on the mean of three hour interval ap indices: 3.9). 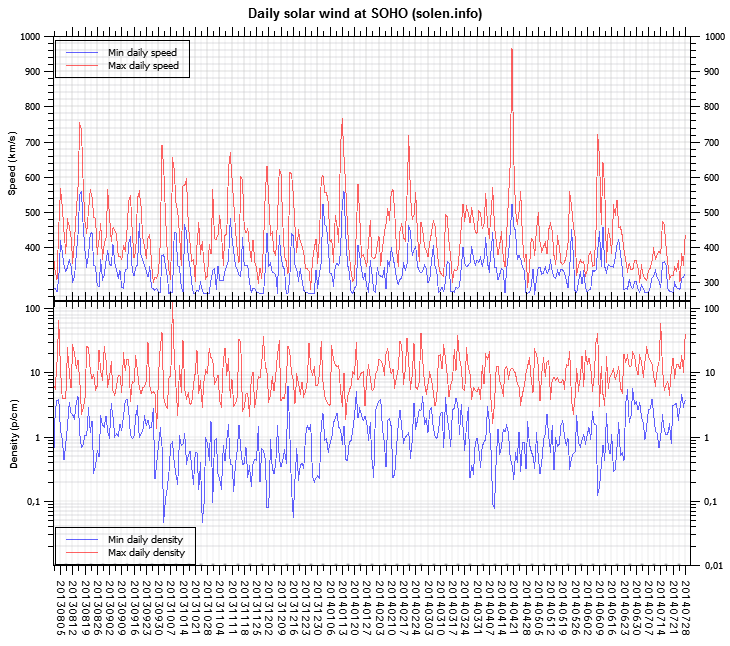 Three hour interval K indices: 11111112 (planetary), 11122312 (Boulder). 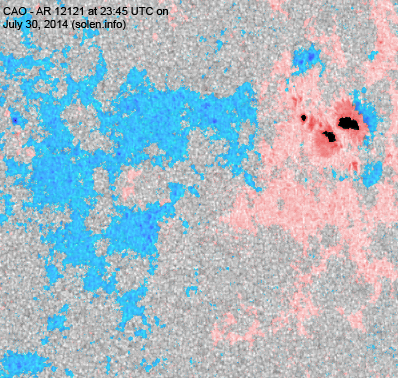 At the time of counting spots (see image time), spots were observed in 15 active regions using 2K resolution (SN: 312) and 14 active regions using 1K resolution (SN: 218) SDO images on the visible solar disk. Region 12121 [N07W52] decayed quietly. 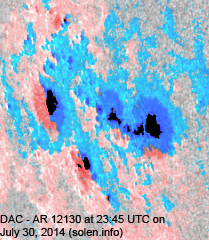 Region 12125 [S14E04] decayed slowly and quietly. 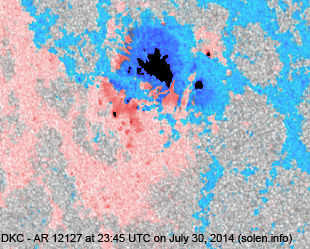 Region 12126 [S10W57] decayed quickly and was quiet. 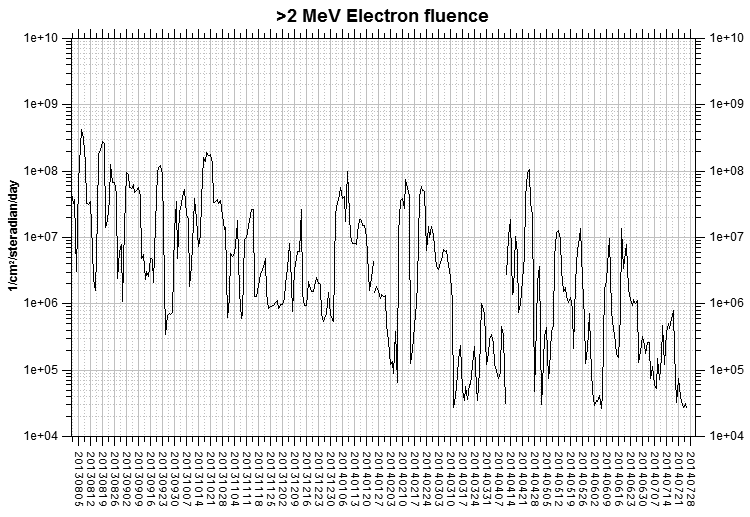 Region 12127 [S08E21] decayed slowly and was mostly quiet. 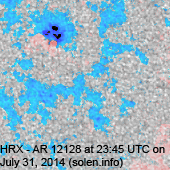 Region 12128 [S21E22] was quiet and stable. Region 12129 [S05W49] decayed slowly and quietly. 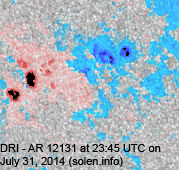 Region 12130 [S08E42] was fairly active during the day. 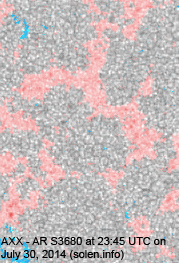 The region decayed losing all trailing poalrity umbrae. 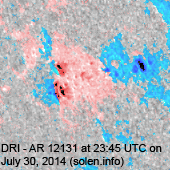 Region 12131 [S19E33] developed slowly and quietly. 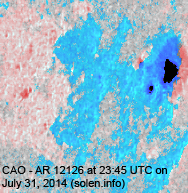 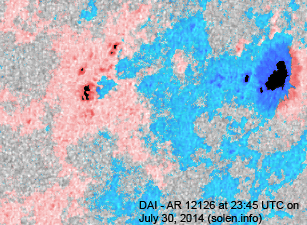 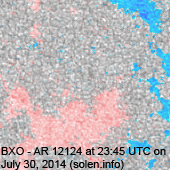 New region 12132 [S19E60] emerged on July 30 and developed quickly on July 31 when the region was numbered by SWPC. 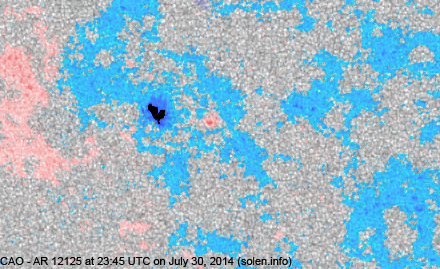 S3673 [S13W13] reemerged with penumbra spots. 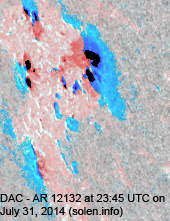 S3680 [N12W12] was quiet and stable. 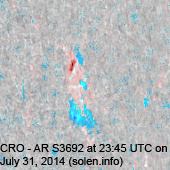 S3686 [N12E10] was quiet and stable. 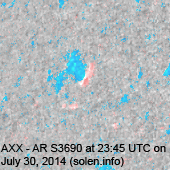 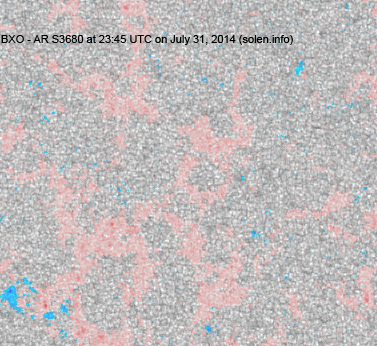 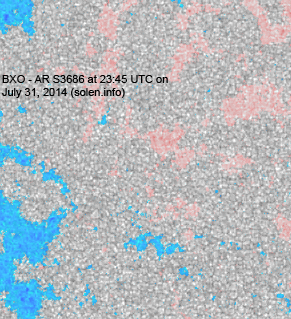 New region S3691 [N09W55] emerged with a few spots to the northwest of AR 12121. 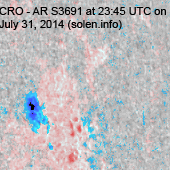 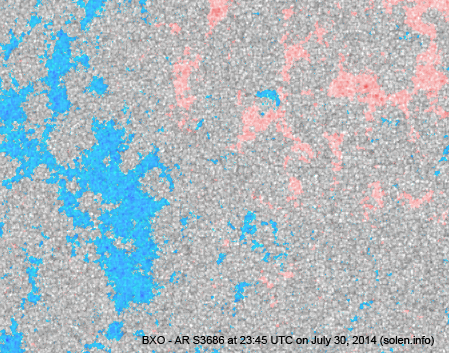 New region S3692 [N09W63] emerged to the west of AR 12121. 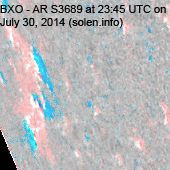 New region S3693 [S16E70] rotated into view. 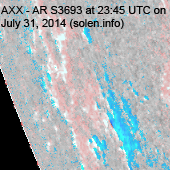 July 29, 31: No obviously Earth directed CMEs were observed in LASCO and STEREO imagery. 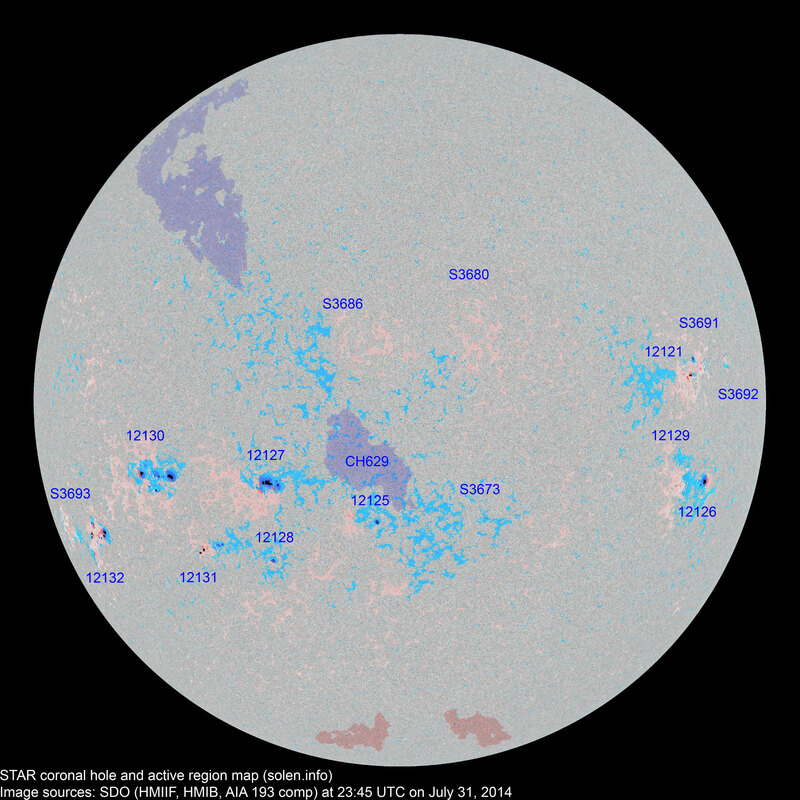 The geomagnetic field is expected to be quiet on August 1. 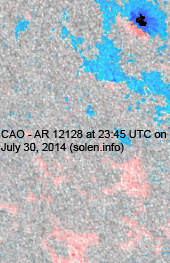 A CME could cause unsettled and active intervals on August 2. 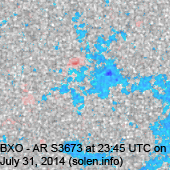 Weak effects from CH629 could cause a few unsettled intervals on August 3-4.